The tropical oasis of Svarga Loka provides a beautiful setting for this bespoke Mindful Triathlon holiday. 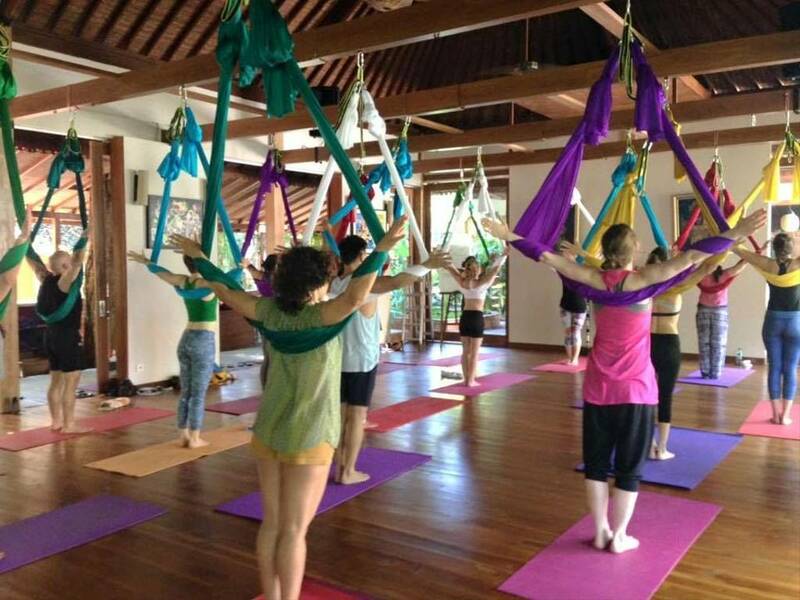 Absorb the nature and ancient wisdom of the local Balinese culture as your mental and physical transformation begins. Improve your fitness and get active with various activities including mobility, interval and functional training, to a cross-country run through the forest. Try your hand at White Crane martial arts, or explore mindfulness in a different way, with a Reiki session to sharpen your senses. 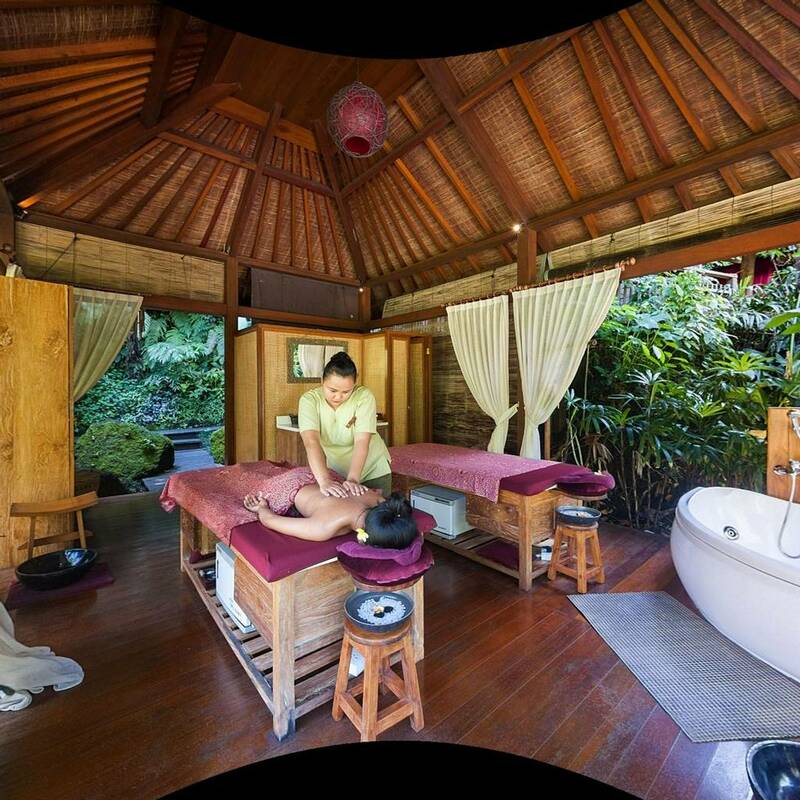 Indulge yourself with a soothing Balinese four hands massage, Kundalini yoga or enhance your spiritual wellbeing with a Chakra balancing session, so you return home connected to your mind and body. 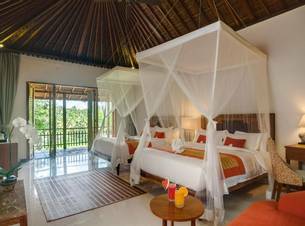 - Daily inclusions are; fresh fruit, complimentary Wi-Fi, turn down service and complimentary daily activities. 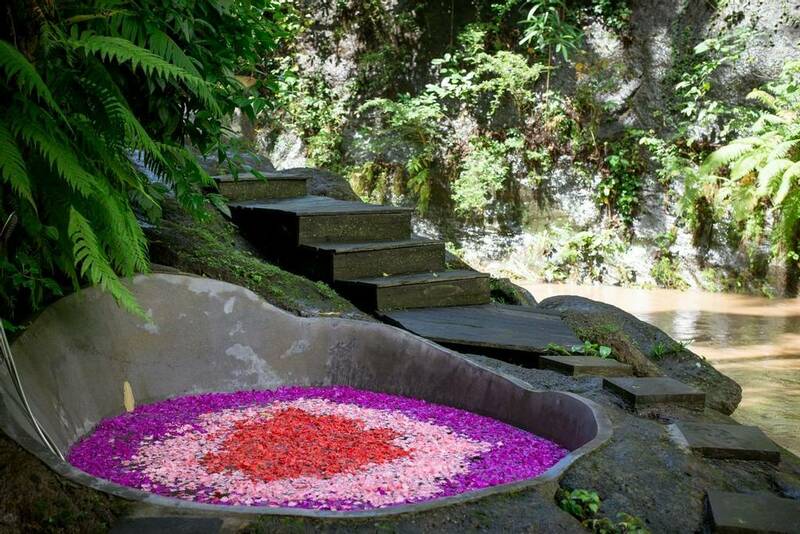 Svarga Loka is a holistic sanctuary located on the riverbanks of the spiritual Campuhan river in Ubud, Bali. Full of rich rainforests and terrace rice paddies, this Indonesian province is home to world famous landscapes such as the “Elephant cave” and multiple Hindu temples, from which Ubud got its reputation for healing. 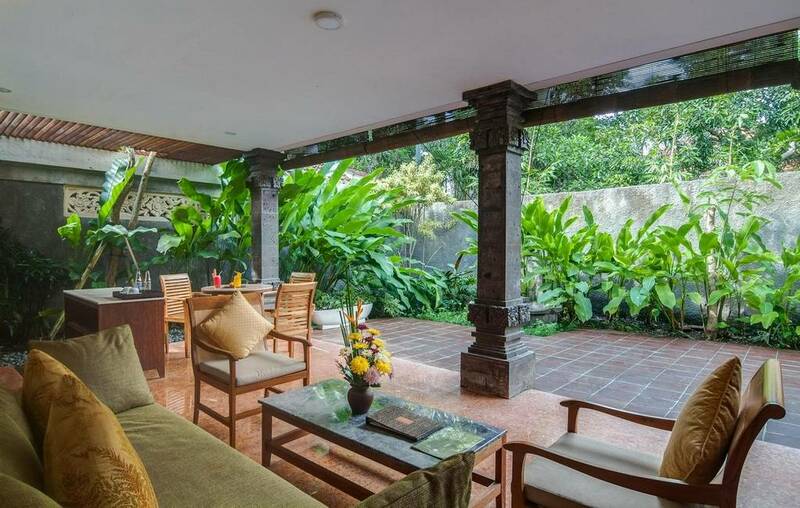 Explore this cultural towns arts and crafts in the local markets where you can pick up antiques, textiles, paintings and jewellery that reflect the beautiful Balinese traditions and surroundings. Using only organic, wholesome, locally sourced ingredients, Svarga Loka creates innovative, healthy dishes that are sure to tantalise your taste buds. The Sanjiwani riverside restaurant exudes natural fresh aromas from the nutritious foods and earthy surroundings, with all dishes finished with a pinch of Balinese sea salt to add minerals as well as flavour. Svarga Loka believes that food is medicine and the key to help restore your health, vitality and well-being. The open-air Ayusha wellness spa offers a peaceful ambiance to fully indulge and relax with holistic-inspired treatments, which will enhance your journey to optimum health. Therapists will focus on desired areas to release stress or tension in your body, and then finish by soaking in the river rock baths and infra-saunas in a picturesque riverside setting. 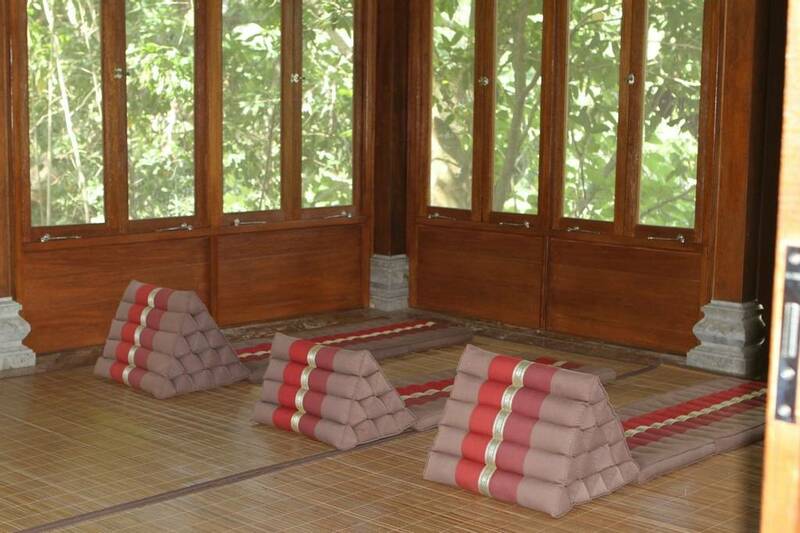 The Ayusha functional wellness centre specifies its treatments around medicine. Be guided through educational and physical workshops such as crystal healing, organ-specific cleansing and energy healing by their highly-qualified practitioners, who use integrated methods to achieve remarkable results. 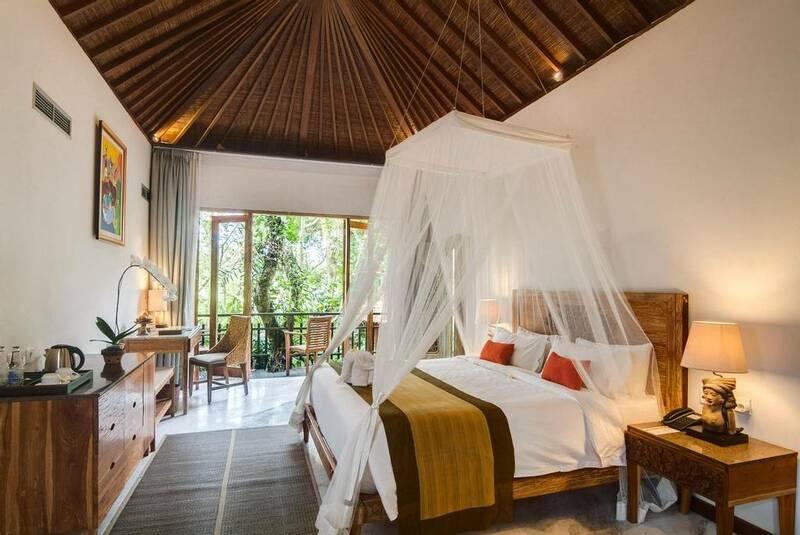 Protected by the abundance of rainforest, the 45 Balinese style rooms and suites are the definition of Asian paradise. All reflect a sense of peace and serenity with the natural furnishings and neutral walls, where you can unwind on the spacious terrace or balcony before retreating to bed for a wonderful night’s sleep. 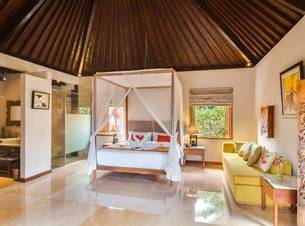 Located at the top of the resort with spectacular views, this room is ideal for single travellers. The simple neutral décor makes the room feel spacious and relaxing. All include an outdoor seating area, a modern en-suite and generously sized double bed, and are situated on both the ground floors and first floors (with balcony). 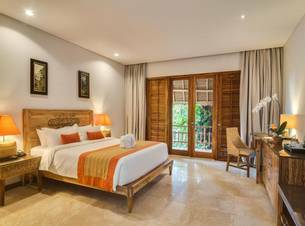 Perfect for couples, these larger rooms offer the same furnishings as the superior room category. 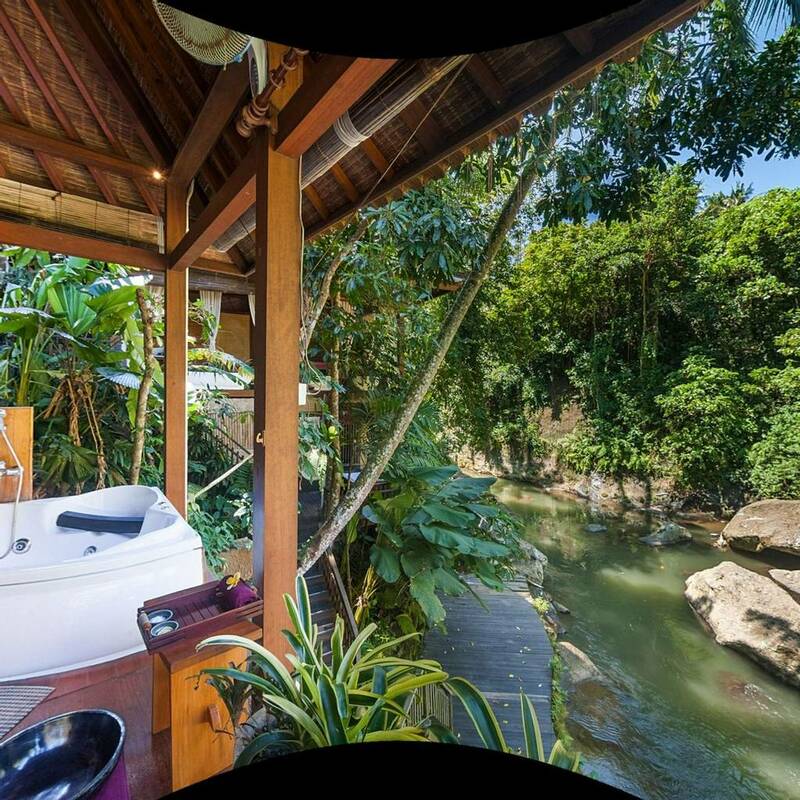 With a unique semi-outdoor bathroom and shower, you can experience the oasis of the retreat from your doorstep. 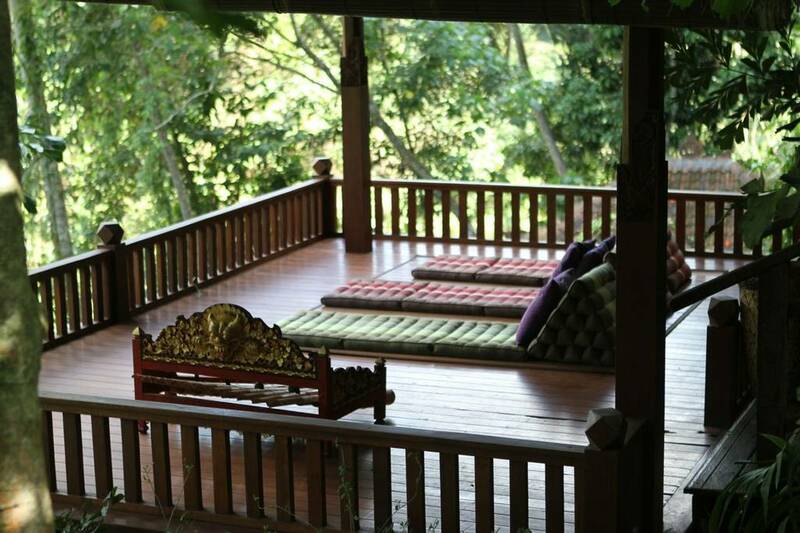 All rooms come with a relaxing outdoor seating area where you can unwind and watch the mesmerising sunset. These luxury suites are nestled in the heart of the retreat, where you overlook the amazing river and forest views from the comfort of one of two 4-post beds. 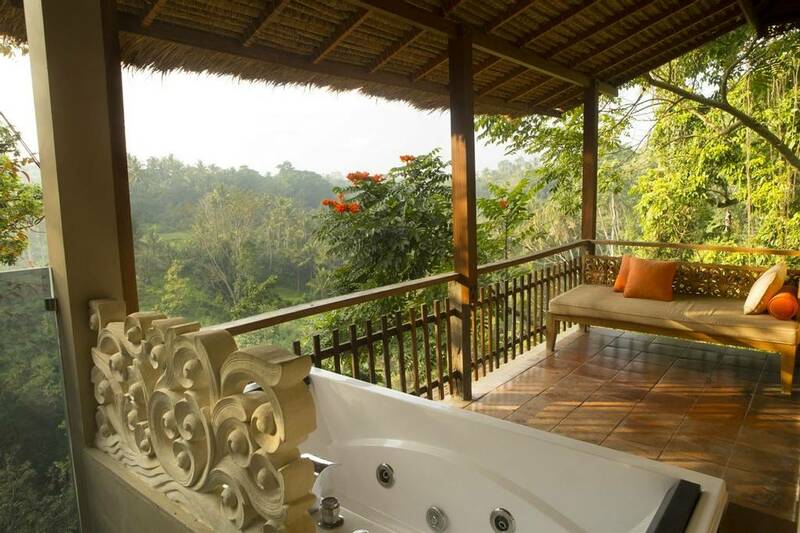 Relax on the spacious balcony or unwind in the outdoor bath, this cosy suite is perfect for families or couples seeking that extra bit of privacy and relaxation after soaking up the Asian sun. Set over 2 storeys, this grand suite is the perfect escape for loved up newlyweds. 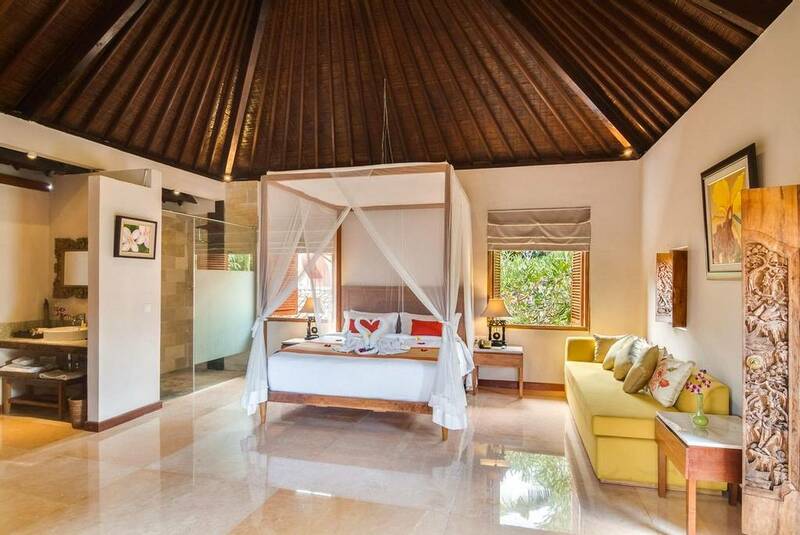 The open plan ground floor living area allows you to unwind after soaking in the sun, before retreating to the outdoor bedroom and Jacuzzi bath guarded by tropical trees and a garden pond. For a more intimate environment, the upstairs bedroom and bathroom provides the perfect setting for a relaxing night’s sleep. 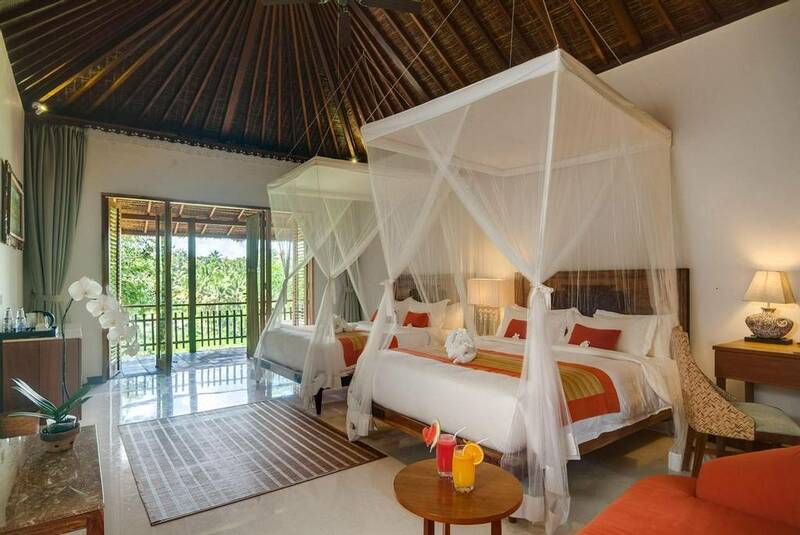 Opt for either a one or two-bedroom master suite that offers breath-taking views overlooking the treetops of the jungle, which you can see from the semi-outdoor living space, kitchen, outdoor bathroom and 3 private balconies. This serene haven is designed to have you feel restored by the natural surrounding beauty with the simplistic contemporary design running throughout. 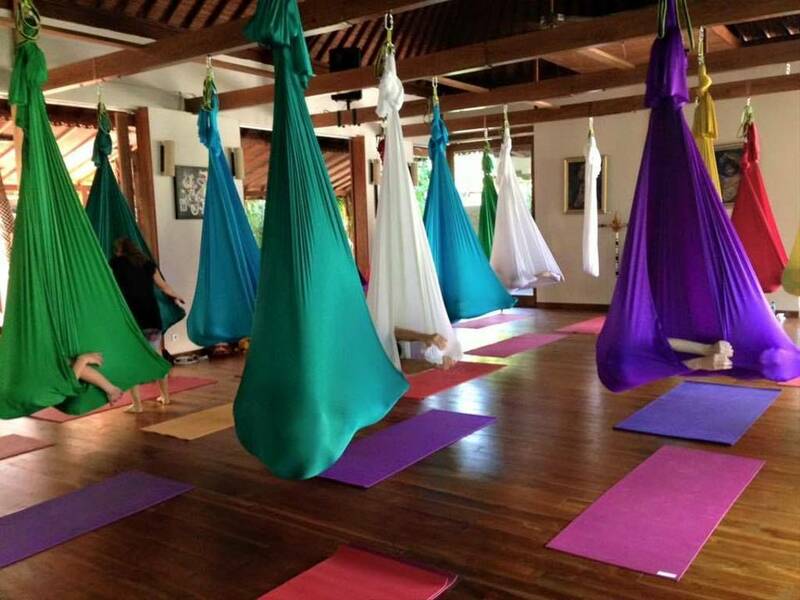 I spent an unforgettable week at this fantastic wellness resort. 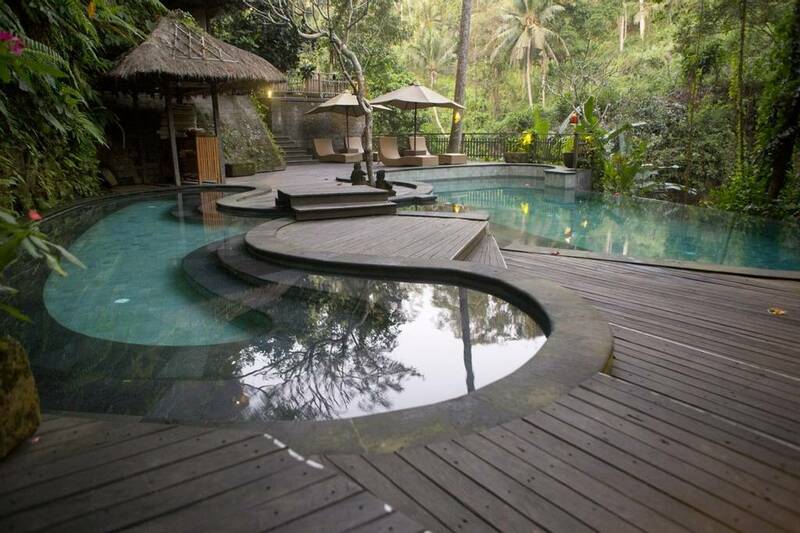 Hidden just 5 minutes from Ubud town, although a world away, this resort offers a peaceful paradise to anyone wishing to rejuvenate and recharge. 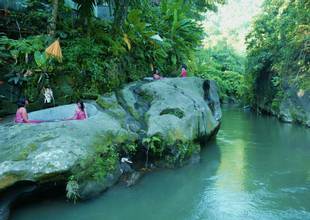 The location is superb, set amongst the rain forrest leading down to the Campuhan river. The complimentary activities offer great value, I did yoga plus the most beautiful morning walk through the rice paddies, as well as my first try at martial arts! 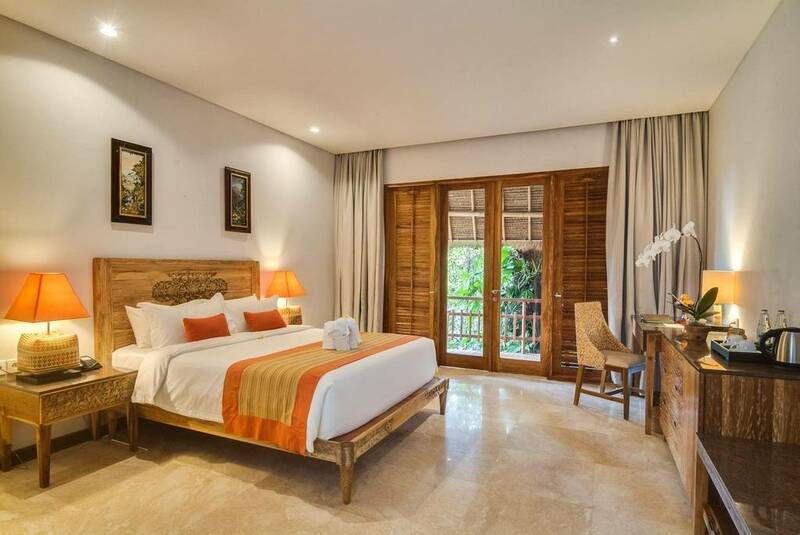 The rooms are comfy and spacious, the spa offers wonderful balinese treatments, the staff are fantastic and the healthy meal options are just what I needed to get my health back on track. Highly recommend!! 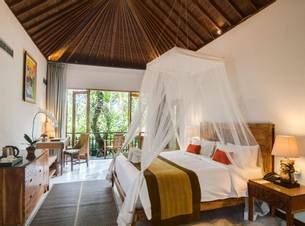 Svarga Loka situated in lush Ubud is a timeless place on sacred land; Mother Nature at her fertile best protected by the masculine magnetic pull of the Ayung River. The energy here cannot be ignored; if in tune to it you will feel connected and 'on', it not, you will feel uplifted and energised - in both ways empowered and at peace with self. 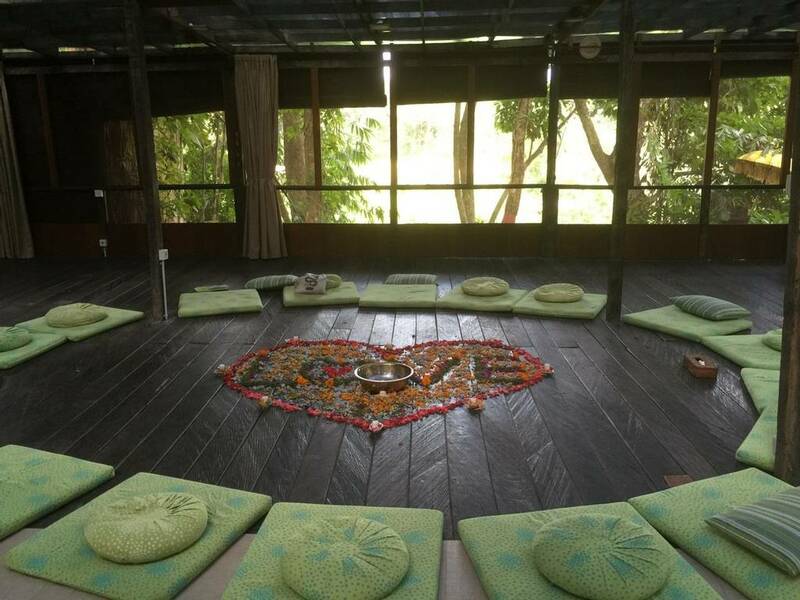 This is a Health Resort, so a visit feels incomplete without at least a trip to The Ayusha Spa, riverside, with its exclusive pavilions hugged by nature and a canopy of birdsong. The body scrub was the best I've ever experienced and the massage relaxed away the modern stresses with my therapist knowing exactly where to work on. Feeling rejuvenated, the in-house yoga classes got me into myself and out of the world, as did my private consultation with a caring practitioner. 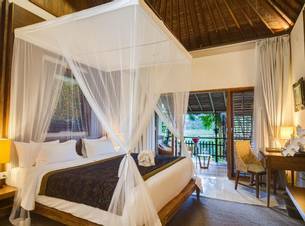 Sleep was peaceful within the comforts of my thoughtfully appointed villa room hearing soothing nature sounds to drift away to, and upon awakening. I enjoyed the discretion of the staff, always ready with a smile and seemingly in tune with when I wanted approaching or not. This I greatly appreciated. Although the restaurant at Svarga Loka served healthy organic foods that were both tasty and nutritional, it does have a great selection of world class vegan restaurants within walking distance allowing for a change. I went on the Campuan Ridge walk, nearby, which I found stunning. Svarga Loka, you opened my heart and filled it anew, for that you have a special place within it. Thank you. 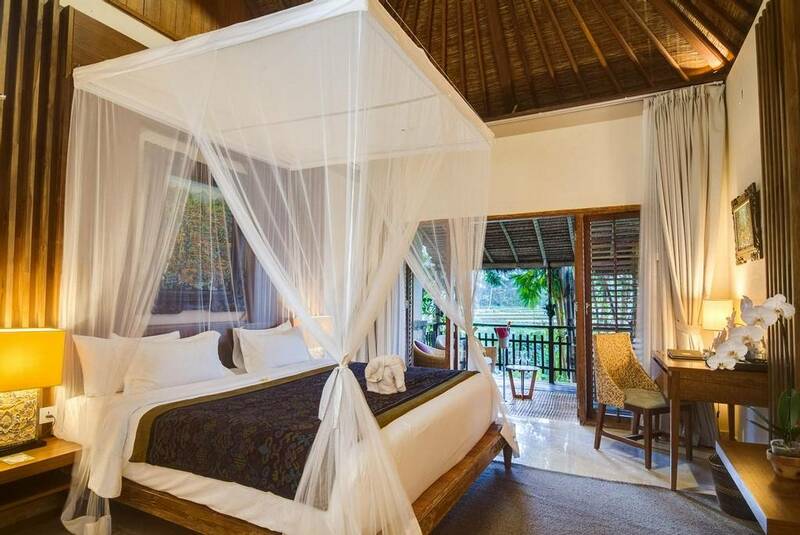 Feel reconnected to nature at Svarga Loka Resort in Bali, tucked away in the Campuhan river valley, offering stunning views of the surrounding flowering trees and shrines to leave you in a state of unending peace. The retreat helps you gain control over your well-being with soulful psychological support, ancient healing rituals and modern health diagnostic techniques. 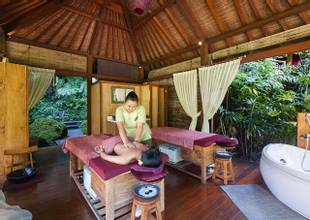 The in-house spa prides itself by offering traditional Balinese purifying rituals. Detoxify your body with a traditional skin wrap known to use a paste made of ginger, cloves, turmeric, galangal and rice. 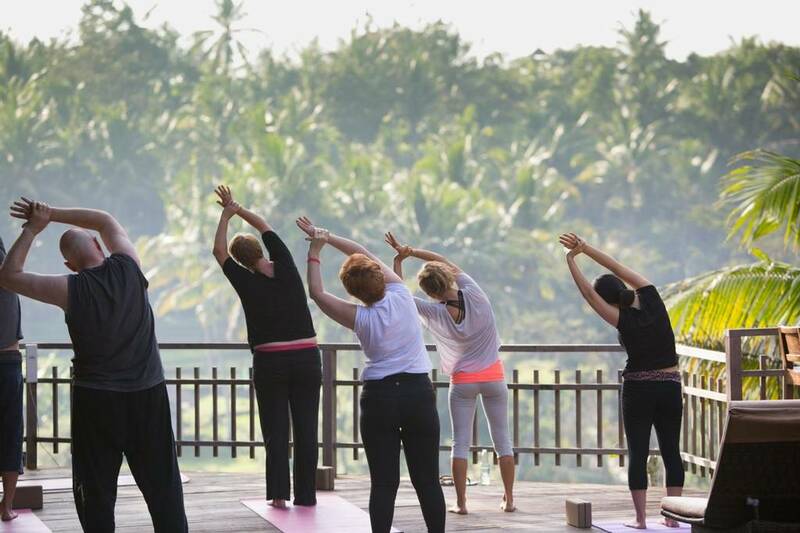 Apart from the wide range of wellness programmes on offer, Svarga Loka also conducts special themed retreats targeting specific health conditions. 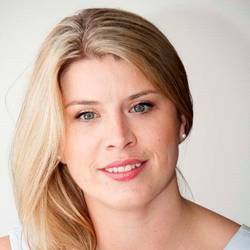 Expert visiting practitioners are called in to focus on issues of smoking, abundance, eating disorders and fertility. The well-trained, warm and friendly staff assure to make your stay comfortable and enjoyable. 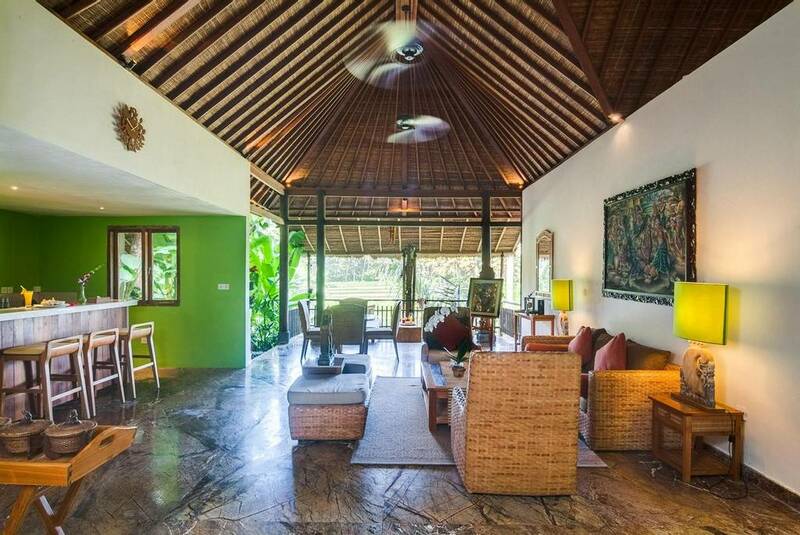 The retreat’s maximum capacity is limited to 45 guests at a time ensuring you of individual attention and guidance throughout your holistic break. Explore the surrounding paddy fields and Campuhan ridge as you set out on a guided morning walk or arrange for consultations with traditional Balinese healers. 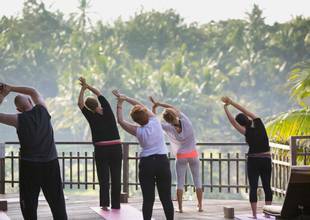 Practise yoga on outdoor yoga terraces with daily morning hatha yoga sessions, known to rebalance your body and mind or evening Kundalini yoga classes for a more soul enriching experience. Smoking is prohibited throughout the property. 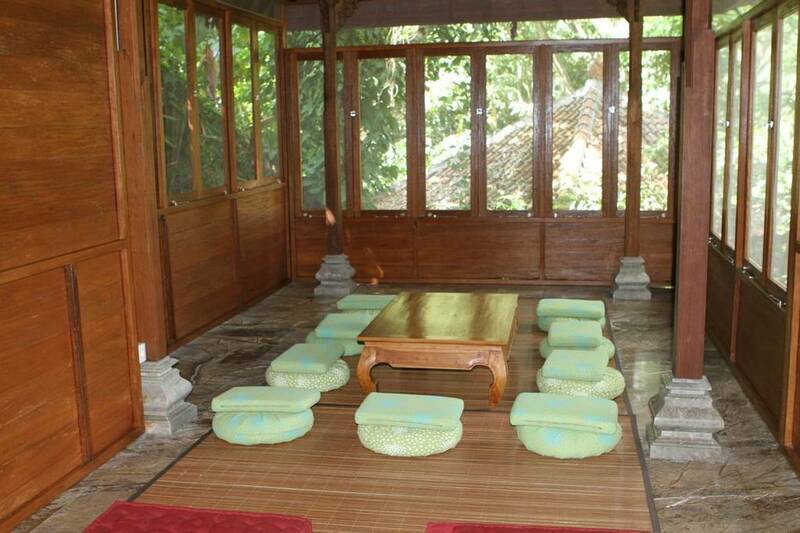 June-August are probably the best months to visit the retreat but also the busiest.